Because of donations from WRAL's #BackPackBuddies and partners of all types across the Triangle, we are able to expand the fight to feed hungry children this school year. Fighting childhood hunger is a monumental task requiring lots of resources. It takes partners large and small. It takes years of work and layers of coordination. It takes a village, a community, a commitment. Luckily, the Food Shuttle has it all! School begins on August 28, and BackPack Buddies deliveries commence the week of Labor Day. That gives school social workers a chance to evaluate the needs of their new student body and adjust numbers accordingly. We ended the last school year having provided BackPacks to 2,134 children across seven counties. We will begin the 2017-2018 school year with 2,368 children and 74 distribution sites on the rolls—that is more than 8,500 more backpacks and 51,000 meals! We are able to do this because of YOU and our amazing media partners, WRAL-TV and MIX 101.5! Thirteen and a half hours after the 2017 #BackPackBuddies Mediathon began, we closed out the evening with an amazing $195,000 commitment of community support for our childhood hunger initiatives! 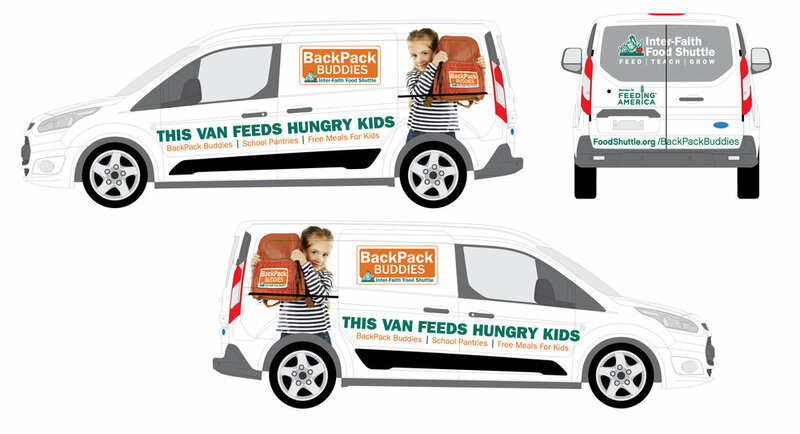 Designs for our new generously donated BackPack Buddies van! We also have amazing friends of the Food Shuttle, including a generous benefactor who provided a dedicated BackPack Buddies van, allowing us to triple the number of BackPacks going to Rocky Mount Middle School. Civic partner Make a Difference Food Pantry in Goldsboro is also helping us expand our service to Johnston County. School Pantries are another way we combat childhood hunger. Last year we supplied 17 school pantries. We begin this school year serving 22 and will be up to 24 by November! All of this growth is thanks to an array of partners and funders—from the Mediathon, to Wake County, Chiesi USA, Food Lion Foundation and the Ligon PTA. We are so grateful that our efforts bring together an amazing and diverse group of supporters. We could not do it without each and every one of you. You are a part of the solution! You are changing lives!